Do you want to look good in front of your boss when the speaker you selected for your meeting gets a standing ovation? Do you want to impress the team by saving money… without all the guesswork, struggle, and those long hours of staying up late to find the right speaker for your next event? The answer is called speaker piggybacking, and it’s now easier than ever with eSpeakers Marketplace. Speaker Piggybacking is the concept of maximizing a speaker’s schedule to include multiple speaking engagements in the same city. If the speaker is already traveling to a particular destination, then it is possible to add on an additional speaking engagement with another event. This strategy can be beneficial for both meeting planners and speakers, and it’s a strategy that is often underutilized. Here at eSpeakers, our goal is to connect meeting planners with speakers, and we want to provide you with the most effective tools and services that make it simple for you to find and hire the right speaker for your upcoming events. Once you understand the concept of speaker piggybacking, you will see that there are benefits available for both speakers and meeting planners. Speakers travel to cities all over the world and often these trips are for a single speaking engagement. It is easy to add an extra day before or after the scheduled meeting to book a second speaking engagement in the same trip, which allows a speaker to boost their income by completing two events within the same timeframe. At the same time, meeting planners can Piggyback on the speaker’s schedule by booking the speaker when they are already in the local area. When meeting planners are strategic with their booking, it is possible to save money that would have been spent on the speaker’s travel expenses. The other option that a 2nd meeting planner may be able to share the travel costs with the original meeting planner, allowing both events to save money on the speaker’s travel expenses. It can be difficult to plan a high quality event with a tight budget, but using speaker Piggybacking can help you leverage your budget more effectively. For example, if you want to hire a keynote speaker but you don’t have the budget needed to cover the travel costs and keynote fee for the speaker you are interested in, then you might be able to Piggyback on the speakers schedule to avoid the higher fees of keynote and travel and still have the speaker attend your event. When meeting planners find out about the benefits of sharing costs to book speakers, they can see why they should be using Piggybacking for every event that they are planning. Meeting planners often schedule the venue, start registering attendees, and look into catering options, but they don’t think to explore other events in the vicinity to see if there is a potential to share a speaker. It is often very easy for a speaker to present at multiple events within the same trip. For example, the speaker might be available to do a keynote presentation at one event and a breakout session at another. Or, they could potentially do several breakout sessions in a row at different events when the venues are located in close proximity. Speaker sharing is also available for companies looking to do onsite trainings for the executive team or other similar team development activities. If you are looking for ways to save money and increase the success of your upcoming event, then one of the best things that you can do is to partner with other planners to incorporate some of the same education and/or entertainment into your event. Other meeting planners are often happy to work with you to coordinate the schedule, because it means that they will also be able to save money by sharing the speaker’s expenses. Meeting planners can even save money by teaming up on marketing and promoting the speaker. Both planners will likely be putting efforts into marketing their event, and they can share on those promotion efforts by working with the same speaker. Speakers are often open to the idea of presenting at multiple events when they are traveling to a specific location, but they are unsure about the methods that should be used to connect with the other meeting planners who might be interested in hiring them to speak. Using eSpeakers Marketplace to search for speakers makes it possible to connect meeting planners with speakers who are scheduled to be in the area near the event date. Speakers can list their availability and travel schedule on their eSpeakers calendar, allowing meeting planners to view potential Piggybacking opportunities. Meeting planners can use eSpeakers Marketplace to search speakers and find their availability based on who will be in the local area, allowing them to potentially find a qualified speaker at a discounted price. Thousands of speakers from around the world use the eSpeakers calendar, making it easy for meeting planners to see the availability for their event date. Whether you are looking for a keynote speaker or you are planning a smaller event, consider ways that you can use speaker Piggybacking to connect with a qualified and experienced speaker. You might consider the value of adding experiences such as VIP access with a well-known speaker, book signings, executive training, or even an intimate dinner with the speaker. Even small-scale events can seem more impressive when a well-known speaker is in attendance. Speakers are often happy to add these types of events onto their schedule, because they will already be in the area and it is simple for them to arrange their schedule to accommodate more engagements. As a result, they can make the trip more productive. For example, if Meeting Planner A plans a sales meeting each quarter and they need to schedule a breakout session, then they can use eSpeakers Marketplace to search for speakers that will already be coming into town that month. If a well-known speaker will already be in the area for a presentation scheduled by Meeting Planner B, then Meeting Planner A can slip into the schedule to fit the breakout session into the speakers calendar. Both meeting planners will be happy with the result, because they can share the travel expenses. At eSpeakers, we want to make it as easy as possible for speakers and meeting planners to connect. We know how difficult it can be to find the right speaker for your upcoming event, which is why we have created the tools that you need to simplify the process. We know when speakers will be in town through our integrated calendar, so it is simple for meeting planners to search through the system and hire a speaker who will already be in the local area. The speaker is happy that they get another job, and the meeting planners are happy that they have the opportunity to connect with a high quality speaker at an affordable price. Speakers simply need to utilize the speaking calendar that they have access to through eSpeakers. Meeting Planners can use the search feature to browse through the directory to find speaker’s availability and schedule. 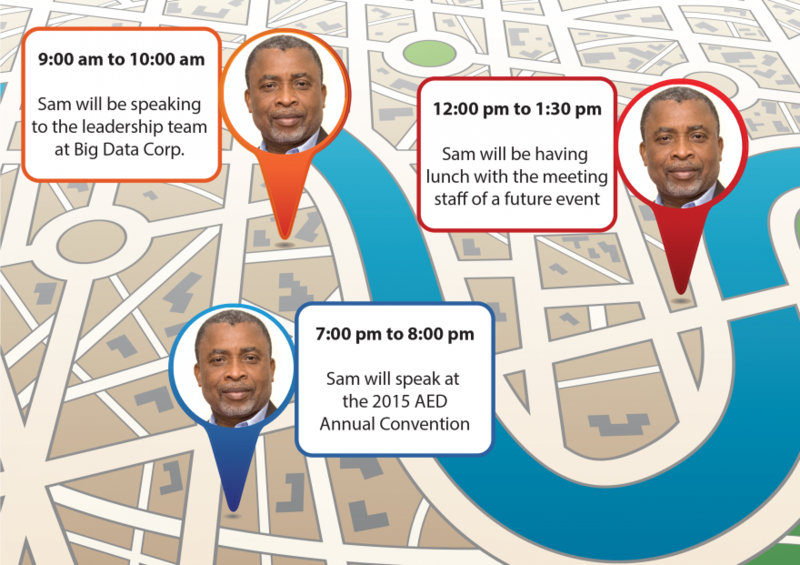 Another option for Meeting Planners is to use the speakerTRACK tool that allows them to follow speaker’s travels and receive notifications about speakers that will be visiting their local city. If you aren’t already using these tools, then we invite you to get started today! Give speaker piggybacking a try today by searching eSpeakers Marketplace www.espeakers.com/marketplace for speakers who will be in your event city, or your local working city. This 13-page ebook outlines proven techniques for finding and hiring the right speaker for your next event.